HÀ NỘI — Mạc Hồng Quân scored the only goal in Quảng Ninh’s 1-0 win over former champions Quảng Nam in the V.League 1's fourth round yesterday in Tam Kỳ City. Playing at home, Quảng Nam started brightly but the visitors didn't take long to get going, but neither side were able to take advantage of several chances in the first half. Ten minutes after the break, the pivotal moment of the match arrived when Rodion Dyachenko and Quân played one-two in Quảng Nam’s box to allow Quân to finish from close range. The hosts picked up the pace in search of an equalizer, and the home fans thought thier team had found it when Hữu Phước’s header found its mark in the 76th minute, only for it be ruled out by referee Hoàng Anh Tuấn for offside. The visitors had secured their first win of the season and are up to sixth position with four points. It was Quảng Nam's third loss leaving them in 11th with just a point. Hoàng Anh Gia Lai will be back in V.League action this weekend after facing a shaky flight to Hải Phòng City on Thursday. Bad weather prevented their plane from landing at Cát Bi Airport, and the crew were forced to turn back and land at Hà Nội’s Nội Bài Airport. As quoted on bongdaplus.vn, heavy rain and thick fog had made visibility poor. The plane was shaking strongly and many of the passengers threw up. A general sigh of relief was breathed when the plane finally landed safely. They will face Hải Phòng at Lạch Tray Stadium on Saturday. Hoàng Anh Gia Lai remain unbeaten in their last five meets with two wins and three draws. In the coming match, Hải Phòng will be without striker Jermie Dwayne Lynch who is suspended. Lynch is the league's top scorer with four goals after three matches. 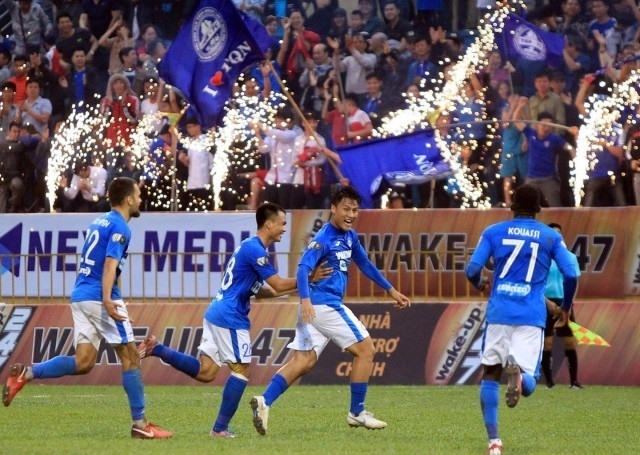 The key match of the round should be between reigning champions Hà Nội FC and former champions Sông Lam Nghệ An at Hàng Đẫy Stadium on Sunday. They are currently place second and third, respectively. Hà Nội recently unexpectedly lost in the AFC Cup but they will have key players back for the game. Sông Lam Nghệ An have made their best start in eight years with two wins and one draw. They also take with them a big group of supporters everywhere they go.